So, the course has been going fairly well. The first 2 days were definitely not as good for me as I remember the first week being, maybe it was the topics. Today has been a difficult day, we spent it on tough conversations. I had loads of questions and even more to learn! Although I must admit I have good intentions when it comes to all this good stuff, it all seems a little too daunting ... and I haven't even begun to apply what I've learnt. It was a mentally exhausting day. 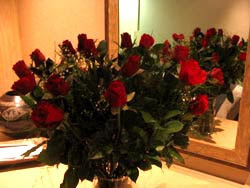 On the mood-lifting side, I received a delivery of red roses today at lunch time from Varen - isn't he lovely, aren't you all jealous :) ? It certainly gave me the encouragement I needed to get thru the afternoon on an otherwise rough day.